Everyone in Eden is assigned a Number, tattooed on their neck, which determines their value and place in the world. On her Numbering Day, Evalene Vandereth anticipates joining the élite. Born in an upper-class family, she knows exactly who she is and what she is worth. Even as the needle breaks her skin, she is blissfully happy. She never considers another outcome, until it’s too late. Now 18-year-old Evalene lives in fear, struggling with her new identity, stripped of her freedom and basic human rights. Can she escape her Number? Is anyone else asking the same question? 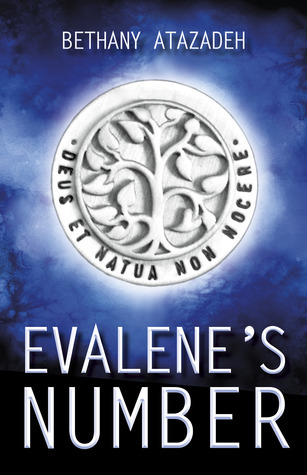 Fans of The Hunger Games and Divergent will love Evalene's Number and its incredible dystopian tale. I absolutely LOVE the cover for this novel and I know Bethany was thinking of changing it (well when I wrote this she was), but I adore it. After reading the blurb I found the number concept really interesting. I wanted to know more and I wanted to be told the MC's stories. This book has two POV (point of view)'s and I really loved the switch and the dynamic between them was lovely. It emphasized the differences and the struggles within the number system Atazdeh has created. It definitely feels like from the very start that characters feel it's impossible to escape the number system through any means. The characters in this book were really complex and had amazing arcs. Evalene was a great character and she goes through so much in her life. Betrayal, abandonment and has to make some tough decisions. Jeramiah was aslo a great character. His arc and emotional journey was actually really interesting to learn about. The pacing in the first half on the nove was slower than I expected but it had a steady build-up and a huge twist. I did enjoy experiencing her day-to-day life and learning about how it changed when she was given her number. The second half had a much faster pace which left you wanting more with each page. Overall, this novel was a fantastic debut with an excellent take on the YA Dystopian genre. Enjoyable for all ages and definitely one you'll want to pick up.